- no add contact (admin area) if _SPECIAL_MODE_OPEN_COMMUNITY (until _LOCK_USER_CONTACT_LIST activated). - display logs by most recently. - correction connection through proxy. - on server access failure, proposes to try with a proxy. - correction attempts to launch simultaneously. - reminders Phenix through Triade. - correction of the automatic deletion of expired reminders Phenix (error message 2304-0). - under discussion, indicates if the contact is from remote / disconnected (good when _ALLOW_SEND_TO_OFFLINE_USER !). - on external authentication : button to change nickname disabled. - conference: button 'History' hidden (since useless). 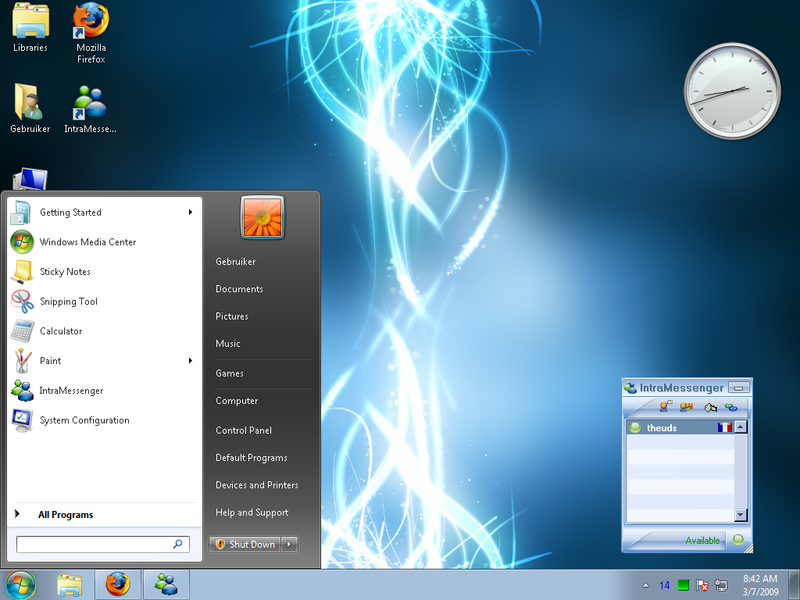 - new theme (vista) for buttons. -key 'Esc': confirm before window closing (if not click on the button). - error correction No. 1017-0 (when using an older version of the server). - spanish translation (thanks to Davidlig). - extern authentication by : OpenGoo and Trellis Desk. - download link more effective (http instead of ftp). - romanian translation (thanks to Cosmin Negut). - bug solved : some clients are being locked after screen shots. - turkish translation (thanks to Kare Bilgisayar). - extern authentication by : OBM and PHPBoost. - bug fix : get messages. - bug fix : extern authentication by : vBulletin. - on extern authentication by a forum (phpBB, vBulletin, SMF, PunBB, MyBB, Phorum, FUDForum) : PM message notifier (PM ou MP) (without connecting to forum in webbrowser). - can join a (short) review at the request to add contact. 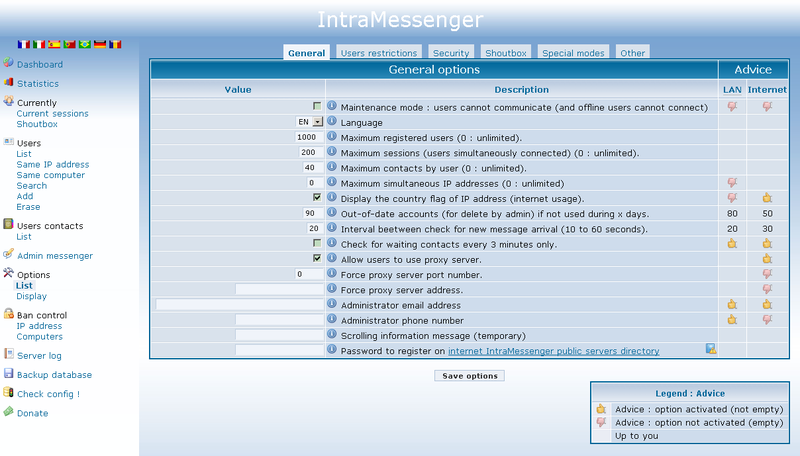 - can customize client (from server) : replace le title (IntraMessenger), about menu... details. - can note (1 to 5 stars) contacts (if allowed by administrator). 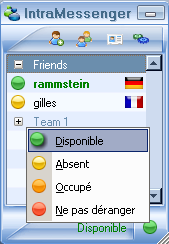 - right clic (online contacts list) : menu contextual menu : can send an email (if writed in profil). - can send parameters to executable : /username="mynickname" : nickname. 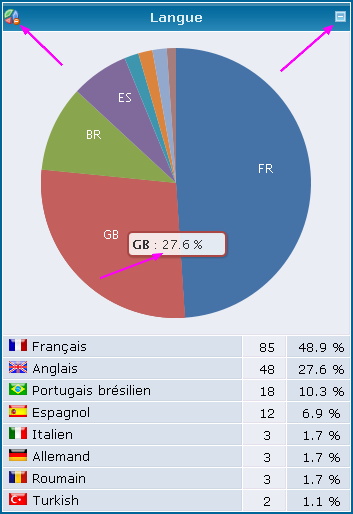 - possibilité de passer en paramètre de l'exécutable : /url="http://...." : server adress (url). - messages windows : good copy/cut/past, smiley and quicks words. - if server offline, wait (gray status) for server come back. - contacts list : boutons en right. - contacts list : contextual menu (right clic) . - can display nickname with uppercase first letter. - can display a tem (horizontal scrolling ) information message (by administrator) in client windows screen. - default : display offline contacts to. 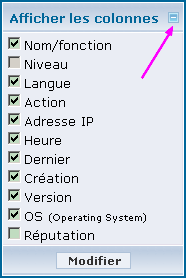 # Can choose menu position du menu : normal (on left) or horizontal (on top) to get larger. .... a) Main software used versions number centralisation (web browser, email...) : help to manage and computer inventory. .... b) possibility to send (same admin messages) an order : stop/reboot IM or computer. # Securing and optimizing scripts with the complete overhaul of the "engine" (folder /distant/ moved in /distant/include/) . FluxBB, GEPI, ImpressCMS, Malleo, Moodle, PMS, phpBMS, PHPizabi, Pligg, Prométhée, XMB-Forum. # Manage IP/PC address ban : direct add/delete in admin area (finish to edit text files). # Improving the usability of the management groups interface. # Option _GROUP_FOR_ADMIN_MESSAGES : possibility to use group manage (without option _SPECIAL_MODE_GROUP_COMMUNITY) only to send admin messages to user's group. # Possibility to send admin messages only to group members (if option _SPECIAL_MODE_GROUP_COMMUNITY or _GROUP_FOR_ADMIN_MESSAGES activated). # Option _ALLOW_USER_RATING to allow users to rate theirs contacts. Possibility to allow access to average (set option to 'PUBLIC'). # Option _ALLOW_EMAIL_NOTIFIER to allow using integrated email notifier. # Option _INCOMING_EMAIL_SERVER_ADDRESS to force incoming server address (for email notifier). # Options to force proxy server address _PROXY_ADDRESS and/or port number _PROXY_PORT_NUMBER. # Option _FORCE_UPDATE_BY_INTERNET to force (client) update by the official internet server. # Option _MAX_NB_IP to allow only a few simultaneously same IP address (zero : unlimited). # Option _PUBLIC_OPTIONS_LIST choose if everybody can see options. # Option _PUBLIC_USERS_LIST choose if everybody can see users list : display or hide combo list on client contacts manage. # Option _PUBLIC_POST_AVATAR allow submit new avatars. # Option _PUBLIC_FOLDER choose /public/ folder name (only if changed). # Option _EXTERN_URL_CHANGE_PASSWORD (url) if exist, redirects user to change password (only on extern authentication). # Option _SCROLL_TEXT : allow to display (scrolling horizontal) an information temporary small message on client main screen title (e.g. : prevent a future maintenance). # Option _FULL_CHECK : if empty, will check for waiting contacts adding only every 3 minutes. # Log nickname and IP rejected (user attempts). # Log (main) admin actions (adding/validating/delete/ban/... users). # Log : display date and file size, and possibility to empty file . # Help to manage and computer inventory (enterprise mode) : computer list : display states : switch on, switch on, sleeping (in first col). # Display hierarchical level in a separate col.
# Duplicates listes : computer and IP address : display contacts number (in parentheses after nickname), same users list. # Users and current sessions lists : display a flag on user can receive admin alert. # User list : display caption only when needed. # Menu : possibility to display full menu, or just useful (not disabled by an option). # Direct link to PHPinfo in check config. # Default value for $PREFIX_IM_TABLE is now "IM_" (instead of "T_") : for new install. - Ability to use capital letters and spaces in nickname/username (if server option (2.0.1 mini) activated). - Change nickname without rebooting. # Direct select external authentication (options _AUTHENTICATION_ON_.... replaced by a single : _EXTERNAL_AUTHENTICATION). # Direct external authentication parameter (dont need to edit file /common/config/extern.config.inc.php). Prestashop, osCommerce, HESK, Tine, SiT!, SPIP, phpMyFAQ, 68KB, Admidio, Feng Office, Adheo, phpFoX, webERP, todoyu, Thelia, Sharetronix. # Update options in 4 sheets. # Statistics: graphics recast (included a view of only 30-60-90 days, and an average weekday). # Options : maintenance mode and enterprise server mode : directly updateable. # Options : direct update mode (normal, or _SPECIAL_MODE_GROUP_COMMUNITY, or _SPECIAL_MODE_OPEN_COMMUNITY). # Option (_ALLOW_UPPERCASE_SPACE_USERNAME) to allow uppercase and space in nickname (col USR_NICKNAME added). # Option (_NEED_QUICK_REGISTER_TO_AUTO_ADD_NEW_USER) to require a quick registration to create account from the client (not for external authentication). # Option (_SITE_TITLE) website title for extern authentication (title for link EXTERN_URL). # More event logs (user create, password deleting of the by admin, rejected connections ...). # Event logs : clearer display (with a logo indicating the type of content). # Look for user, by IP address. # Users detail : option to hide the other (not visible to potential contacts): Deletes the function / name. # Portuguese translation (have brazilian already). (replace options _AUTHENTICATION_ON_... by a single one : _EXTERNAL_AUTHENTICATION) .